As football fans rush to calculate the winning probability for each team in the World Cup, Achilles the 'psychic' cat will be using his cat sense to predict the results. Achilles, a resident of the Hermitage museum in Saint Petersburg, is currently in full training mode, studying the teams heading to Russia to compete in the world's biggest football championship. According to his veterinarian Anna Kondratyeva, Achille's deafness makes him a better prognosticator than other cats because "he's absolutely unbiased, he's deaf to any comments from the fans so he probably feels with his heart and a special cat sense." Achilles will only be predicting the games played in Saint Petersburg. "He will make his predictions the morning of the game. For breakfast, we’ll put two identical bowls in front of him with cat food and a little flag of the countries playing." So whichever bowl Achilles eats from — that's the country that will win. 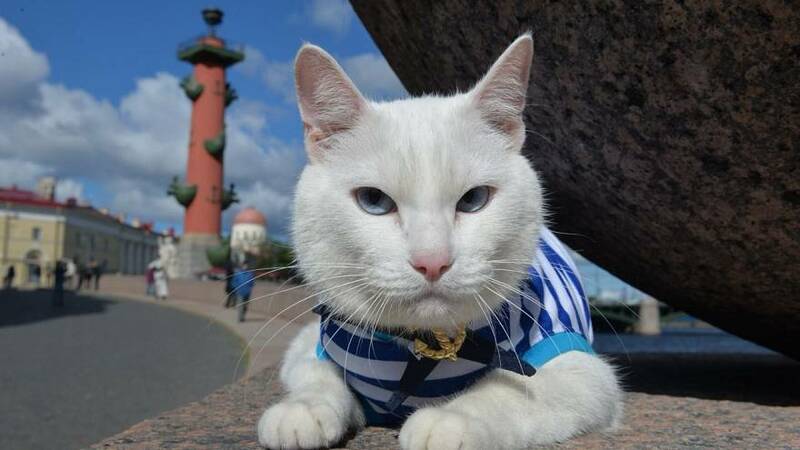 The white cat with blue eyes wasn't chosen at random, he has a history predicting football games. Last year, he determined the results of the confederation cup matches played in his hometown. He guessed without a single error the winner for each game, including one that ended in a draw said Kondratyeva. When Achilles isn't training he enjoys kicking balls in the long corridors of the Hermitage museum and posing for pictures outside in the gardens.